Shopping in London really shouldn’t begin and end with Harrods. If you want to see something of the grandeur and tradition of London, then Mayfair & St James’s are the areas to explore. It’s a little bit ‘hidden away’, tucked to either side of Piccadilly, but this is where you will see some of the most amazing shops in the capital. Let’s start with the Royal Robe Makers. Ede & Ravenscroft, on Burlington Gardens (near Piccadilly Circus), were first commissioned to make Coronation Robes by King William and Queen Mary back in 1689, and have continued to make them ever since to exactly the same pattern, “.. a six yard train in best quality handmade purple silk velvet, trimmed with best quality Canadian ermine … and fully lined with pure silk English Satin … in the traditional manner”. This is a company that has unrivalled knowledge of the correct formal attire for kings, queens, lords, ladies, heralds, judges, bishops – anyone, in short, who has to dress ceremonially. Not only do they know how you should dress, but they can also advise on how you should look after your robes, given that you may not need to wear them again for another 200 years. 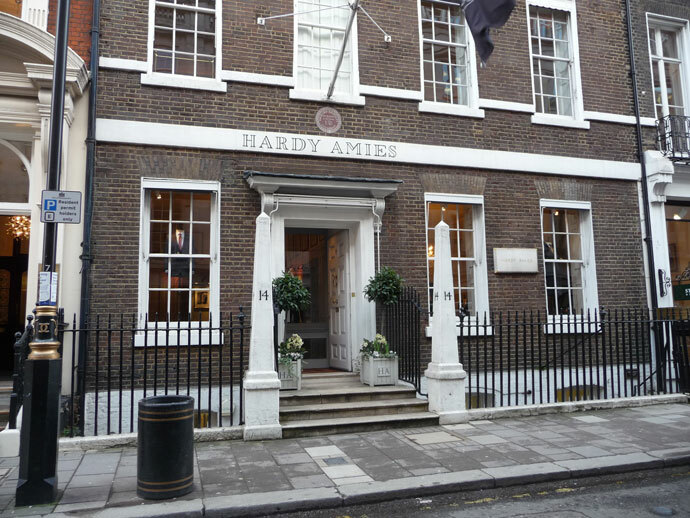 Around the corner in Savile Row, a street famed for its traditional tailors, Hardy Amies is so discreet that there isn’t even a shop front to this beautiful 18th century house, but you’d expect nothing less from the man who was official dressmaker to Queen Elizabeth II for more than 40 years. As with most businesses in this area, they have an impressive client list, with occasionally an unexpected name – Amies dressed the 1966 World Cup-winning English football team (in suits) and also created the costumes in Stanley Kubrick’s film “2001: A Space Odyssey”. 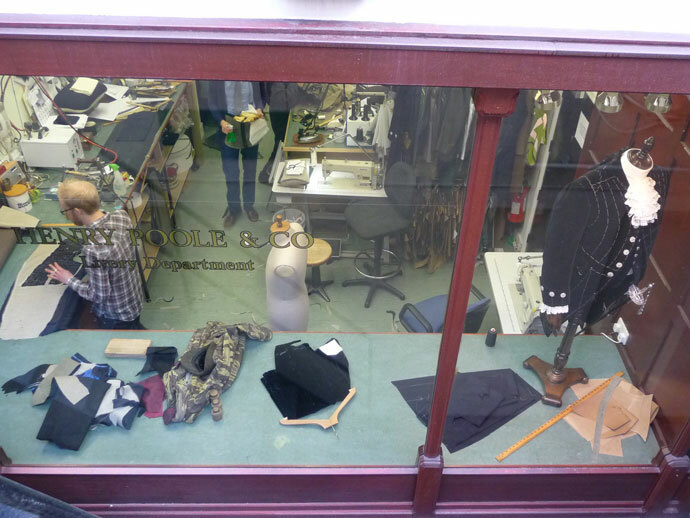 Next door you can look down into the basement of Henry Poole’s and see those traditional tailors hard at work. There is a story that in the late 19th century some American gentlemen sought Henry Poole’s advice on what they should be wearing to dine with the Prince of Wales. Poole’s supplied them with dinner jackets similar to one the Prince wore, and when they took them back home to the Tuxedo Park Club in New York the style quickly caught on and they became known as tuxedos. 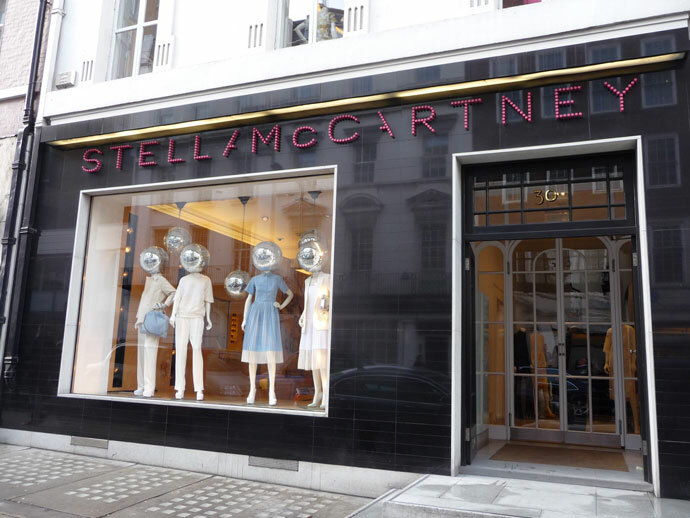 A short distance away in Bruton Street is a contemporary English fashion icon, Stella McCartney. Parents Paul & Linda McCartney were a hard act to follow, but Stella was crowned British Fashion Designer of the Year in 2012 for her designs for the Team GB athletes for the Olympics. Another Bruton Street door that’s oh, so discreet, is that of Hartnell, the couturier who created Queen Elizabeth II’s wedding and coronation dresses. Known for opulent ornamentation – “I despise simplicity” – he chose to embroider the wedding dress with flowers inspired by Botticelli’s painting ‘Primavera’, and the Queen’s coronation dress was covered with thousands of seed pearls and crystal beads. Hartnell also designed clothes for the Royal Family’s State Visit to France in 1938, which Christian Dior acknowledged as influencing his own post-war ‘New Style’. 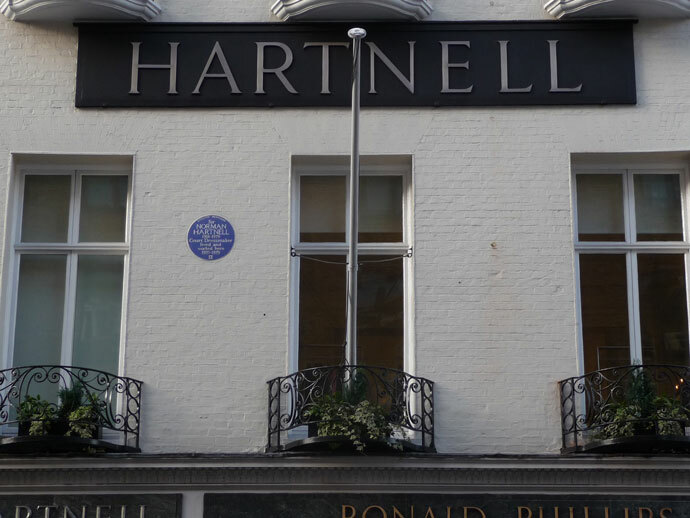 Coincidentally, on the wall opposite Hartnell is a grey stone plaque telling us that this is where the Queen was born – not in a palace or a hospital, but in the home of her maternal grandparents. 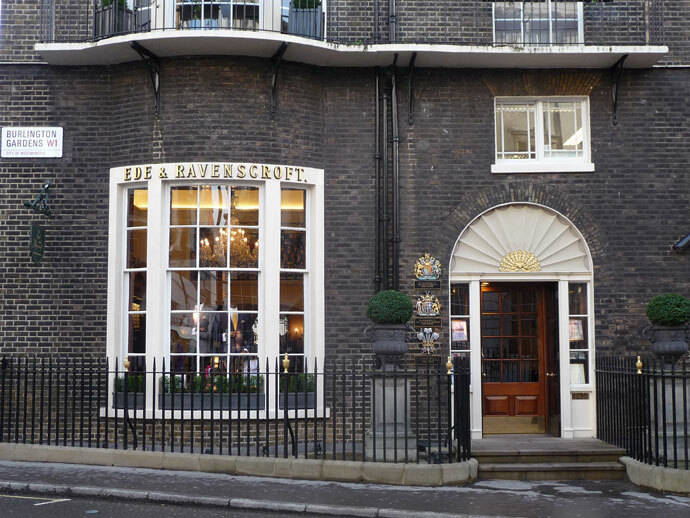 Today that house has long since vanished, replaced by an office block that is occupied at the corner by one of the grandest car showrooms in London, Jack Barclay Rolls Royce & Bentley. In Grafton Street, almost facing each other, are two of London’s most important jewellers. 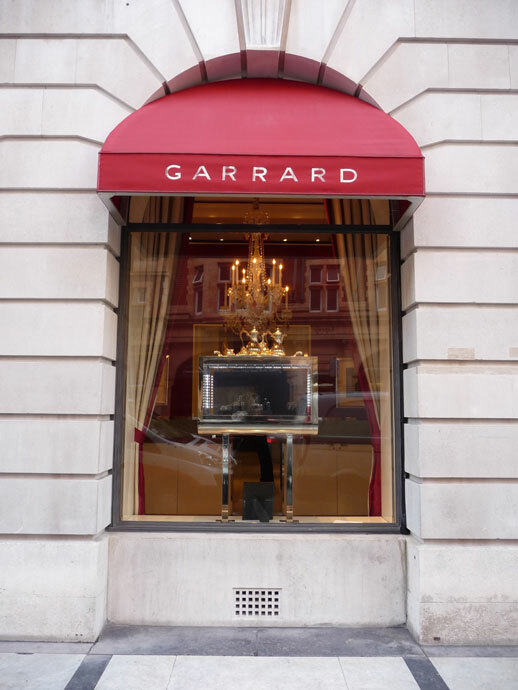 Garrard was once the Crown Jeweller, and created the Queen Mother’s Crown, which you can see in the Tower of London. For a while, Mick Jagger’s daughter Jade was their creative director. Back in the early 80s, Lady Diana Spencer chose one of their stock rings for her engagement to Prince Charles – a ring that was then given by her son Prince William to his own future wife on their engagement. 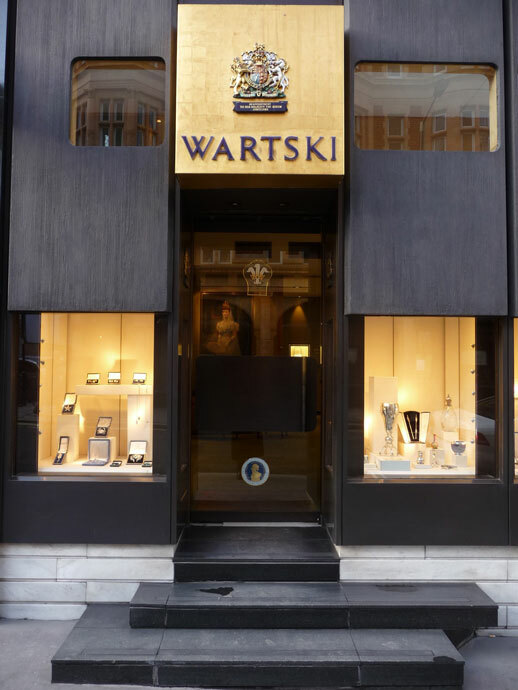 For their wedding ring, Prince William and Kate Middleton crossed the road to Wartski. There is a certain appropriateness to this – Wartski was founded in north Wales by a refugee in the 19th century. Now in the heart of Mayfair, one of the most glamorous and expensive shopping areas in the world, they still describe themselves today as Wartski of Llandudno, a small seaside town in north Wales. Prince William is Prince William of Wales. For a while he worked and lived in north Wales. The wedding ring was made from Welsh gold. But if you’re not looking for a wedding ring for a future queen, Wartski is the place to buy Fabergé. From there I suggest you take a stroll down Bond Street. 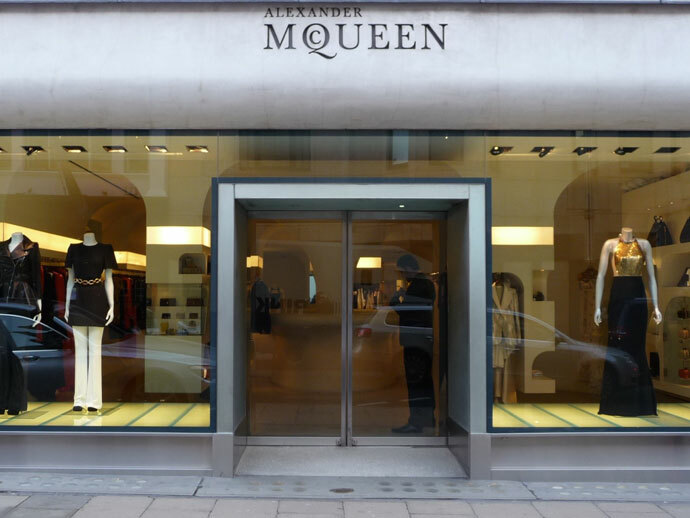 This may take a while, as there is lots to look at in this street of designer fashion, but definitely pause at the bottom of the street to peer into the windows of Alexander McQueen. Another British icon, once known primarily for eccentricity and the wilder edges of fashion, the company not only created THAT WEDDING DRESS, but also seem to be regularly dressing the Duchess of Cambridge (Kate) for other important moments. Now let’s take a stroll through the 18th century Burlington Arcade. I use the word stroll advisedly, as the Beadles will stop you if you do anything unseemly like running or whistling. 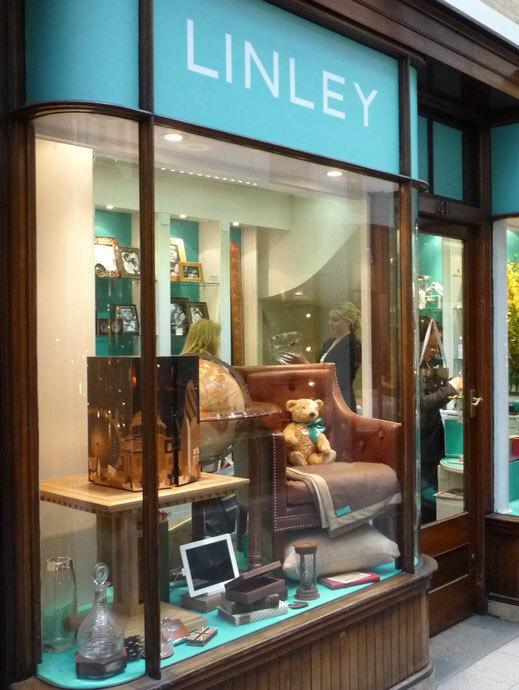 The arcade is a great place to buy antique silver and jewellery, and cashmere, as well as other luxury goods. 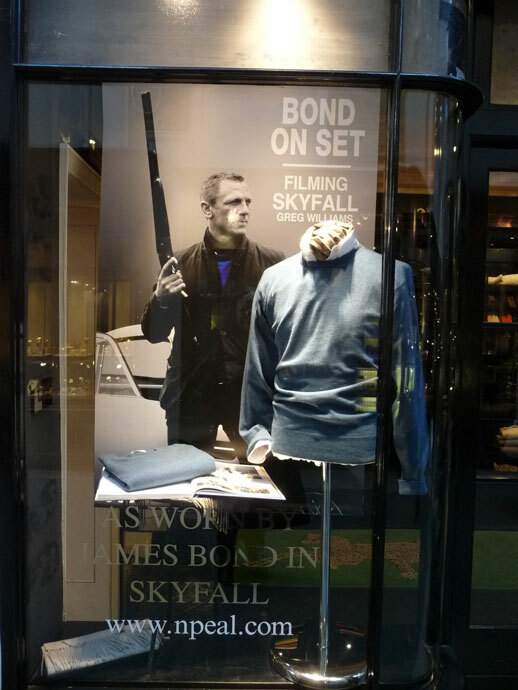 N Peal has been supplying cashmere to the stars since 1936 – most recently seen being worn by James Bond in Skyfall. None of us will ever forget that scene during the 2012 Olympics Opening Ceremony when James Bond went to fetch the Queen from Buckingham Palace!! I don’t know how well David, or Viscount, Linley’s name is known outside the UK. He’s the Queen’s nephew, the son of Princess Margaret and her photographer husband Lord Snowdon. He has artists and designers throughout his family on his father’s side, and he’s a fine craftsman himself. He trained at John Makepeace’s Parnham House School for Craftsmen in Wood, and here he sells small gift pieces. If you want to buy his furniture, you’ll have to head for his Chelsea showroom, and if you’d like to try some out before purchasing, then Claridge’s Hotel offers a suite designed by Linley. South of Piccadilly is Jermyn Street, the very heart of tradition with a somewhat Dickensian atmosphere. Paxton & Whitfield have been selling cheese since 1742. Floris has been selling perfumes and toiletries for 8 generations, and will blend to order, as they did with a Rose Geranium Toilet Water for Marilyn Monroe. 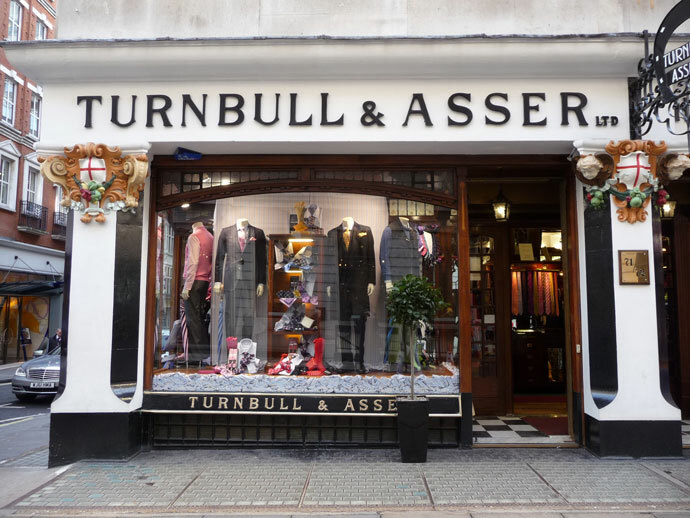 Harvie & Hudson have been making bespoke shirts for three generations, Taylor’s of Old Bond Street have been selling gentlemen’s toiletries since 1854, Turnbull & Asser dress the Prince of Wales and James Bond, and Crockett & Jones sent their shoes with Shackleton to the South Pole. Everything here is hand-made, and only of the best quality. Winston Churchill once said “A gentleman buys his hats at Locks, his shoes at Lobbs, his shirts at Harvie and Hudson, his suits at Huntsman and his cheese at Paxton & Whitfield”. At the bottom of St James’s Street, where Henry VIII’s St James’s Palace looms in front of you, Lobb’s are at No.9. 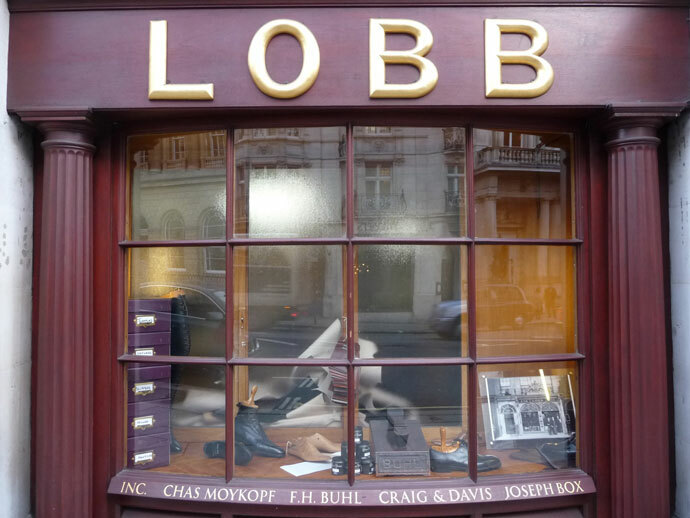 Lobb’s handmade shoes are worn by the Duke of Edinburgh and Prince Charles, and in the window you can see examples of the wooden lasts that they hold for each of their customers. 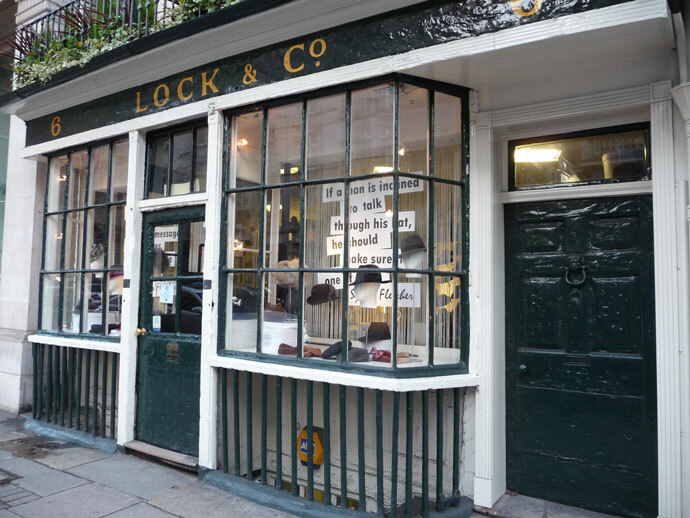 Also on St James’s Street, Lock’s is the oldest hatter in the world, founded in 1676. They commissioned that most English of hats, the Bowler, for a special order for the Coke (Earl of Leicester) family’s servants in the 19th century, and for many decades it was essential wear for the English businessman. They tell the story that once a postcard was delivered to them from abroad; it was addressed simply to “The Best Hatters in the World”, and it found them. 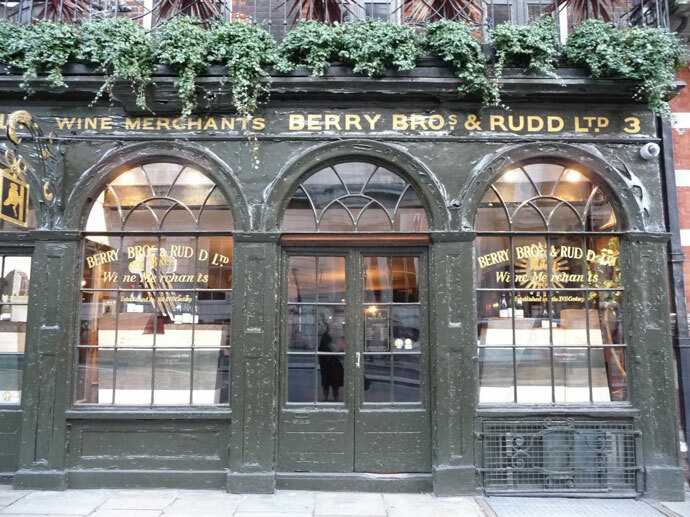 The first business at No.3 St James’s Street was established in 1698 by the delightfully named Widow Bourne, and out of this grew today’s wine merchant with its ancient shop front. One day in 1923 the partners were joined for lunch by a Scottish artist, and of course the conversation turned to whisky. It was felt that Prohibition could not last forever in the USA, and so a plan was hatched to blend a whisky that would be pale in colour – not looking too strong and alcoholic, it might even be mistaken for tea – so that when the law changed, Berry Bros & Rudd would be ready for the new market. Out of that lunch was born Cutty Sark whisky. I hope this has inspired you to do a little exploring next time you’re in London.